The dial above is an excellent example of a well preserved dial. Care should always be taken when setting the clock to avoid contact between your hands and the dial to avoid what happened to the dial in the picture below. In this picture you can see how a great deal of the silvering on the dial has been worn off due to improper handling. 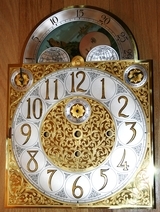 The dial in the previous picture has now been restored to its former beauty! Those who are blessed enough to own a Herschede Tubular Bell Grandfather Clock are aware of the fine quality of these wonderful clocks. 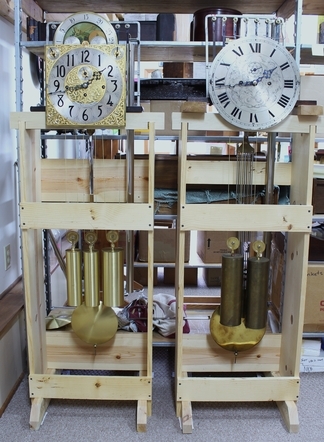 What they may not be aware of is the special attention these clock mechanisms must receive in order to work properly. Routine maintenance is of course important but when these fine clocks eventually wear themselves out where will owners go to be certain their fine clock receives the special attention it deserves? If you are close enough to take advantage of our service we hope you will give us a chance to show you what we can do for your clock. This page is dedicated to those discerning owners of Herschede clocks and or those who are looking to perhaps own one themselves and are gathering information before purchase. 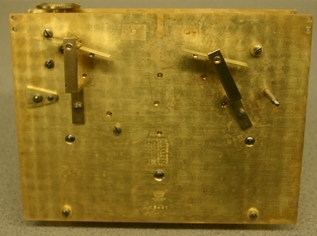 More information on the Hershede clock appears below after the following photos. 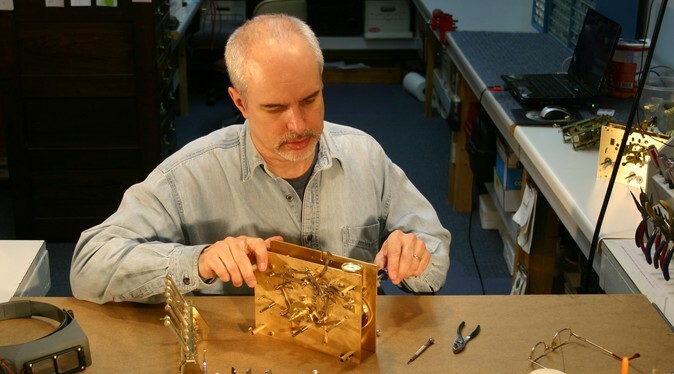 Why trust Master Clock Repair to restore your fine Tubular Bell Clock movement? First of all, be sure to check the "Qualifications" page for all of Michael's credentials. Secondly, it is important to understand that there are very few people who can say they have significant experience with these large, somewhat complex tubular bell mechanisms. There are many common clocks that pass through the average repair shop over and over again allowing a repairman to gain a great deal of experience over a relatively short period of time. This is not true of tubular bell clocks in general and Herschede clocks to be specific. This is due to the fact that these clocks were very expensive and very few people were able to afford them. Consequently they end up in repair shops only sporadically. 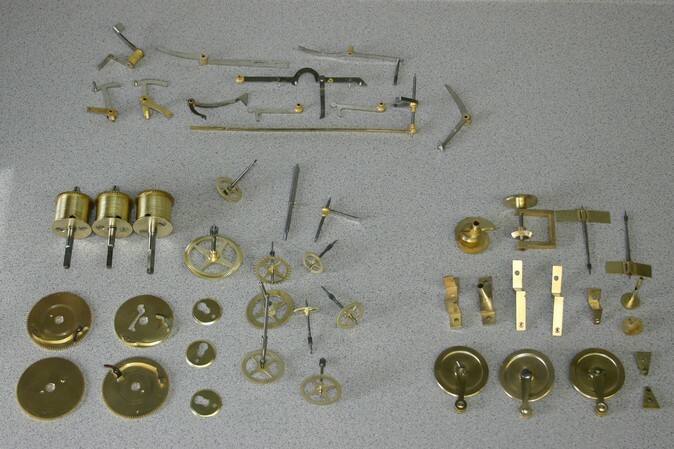 To give you an idea of how "rare" they are, we repair approximately 1200 clocks per year yet only see 5 to 10 tubular bell clocks during that same period. Fortunately, after 33 years in the trade, Michael has had the privilege of repairing, relatively speaking, a large number of these clocks. As a result of his experience he teaches a class on the finer and often overlooked points of successfully restoring the Herschede movement. 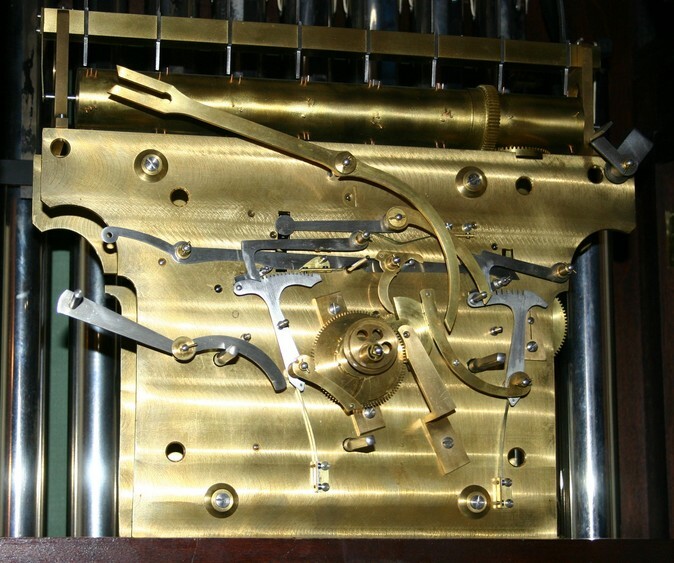 Photo above is of the gears and levers that make up the Herschede tubular movement. This picture was taken after these parts had been cleaned, buffed and the pivots burnished. 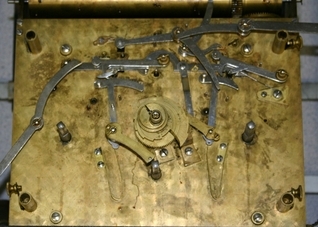 Movement with levers still on before restoration. 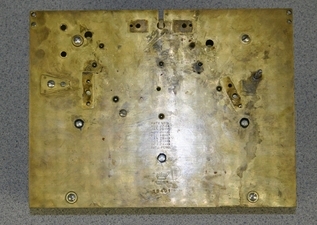 Rear of same movement before restoration. 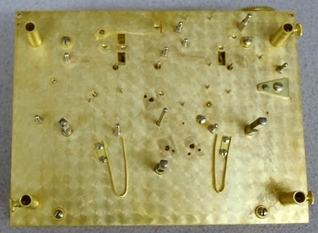 Same movement after cleaning and bushing with levers off. 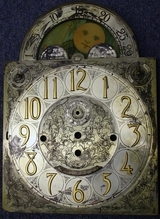 Herschede Hall Clock Company was most famous for their large tubular bell clocks. 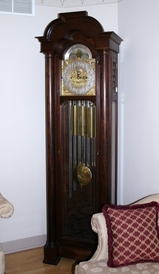 Although there were other smaller clocks available the tubular bell clock was the flagship of their line. 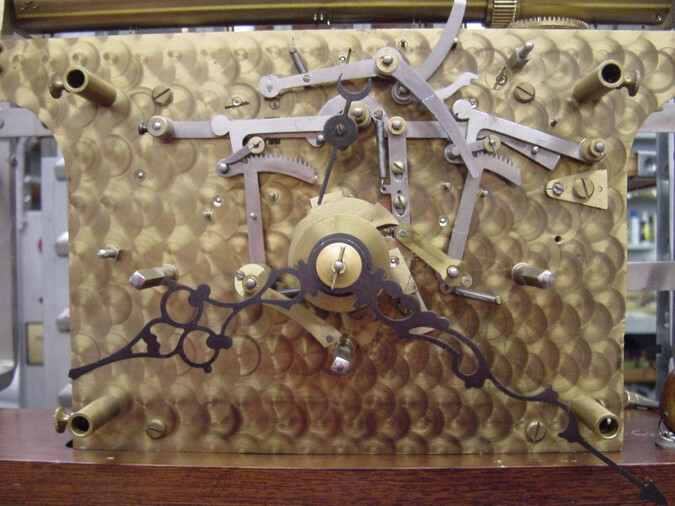 Herschede was one of the last American companies to manufacture their own clock movements. Many American companies made their own cases but imported German mechanisms to perform the work behind the dial. 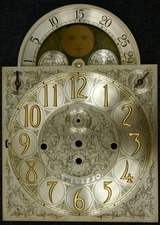 During the 1970's Herschede began to suffer as most consumers were purchasing the lower cost clocks being made by Howard Miller, Ridgeway and Sligh. Although these were fine clocks they could not compare to the quality of the Herschede product. Under increasing pressure from declining sales, beginning in the early 1970's, the quality and durability of the Herschede movements began to decline and the company eventually went out of business in 1984. Although these late production movements were at least equal to all other clock products being made during the same time frame the discerning buyer of a used Herschede clock will look to purchase a more vintage model (prior to 1970). Herschede Movement #2 - "First Quality"
This class was taught in Ohio's beautiful Amish Country this past July of 2018. We often hold our annual convention there. Watch an 11 minute video of Michael explaining how to mount a dial on a Herschede Tubular Bell Movement. 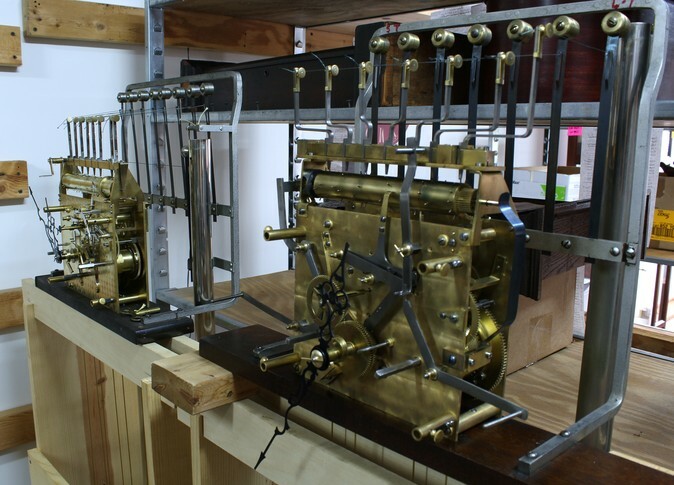 Here we have two recently restored Herschede tubular bell movements. The one on the left is the more common nine tube, three weight movement and the one on the right is a 7 tube, two weight movement which is designated "movement #5". These two clocks have just been overhauled. Each Herschede movement is tested for a minimum of 12 weeks prior to delivery. Quality control on Herschede repairs is essential to a proper repair. The clock on the left has had the weights, pendulum and dial restored.